Eugenia involucrata growing shrub‎ of the genus Eugenia and also known as Cherry of the Rio Grande, Eugenia involucrata perennial evergreen – semi-deciduous plant also used as ornamental plant, can grow in tropic, mediterranean or subtropical climate and growing in hardiness zone 9+. Flower color white about 1 cm with prominent stamens. 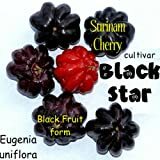 Fruit color purple-black in the top of the fruit there is crown. New and Healthy PITOMBA - Eugenia Luschnathiana Pot Starter PLANT Fruit Starter Tree Potted 5-9"
Grumichama Eugenia Brasilie Brazilian Cherry Plant Tree Seedling FROM HAWAII 6-10"
What can be done with big quantities of Eugenia involucrata fruits?